Typically, netbook or nettop is suitable for normal office applications and web browsing activities but it may not able to handle CPU or graphics intensive applications well like some middle range or mainstream notebooks. In order to fill the gap, Haleron, a Columbian based PC manufacturer has taken extra initiative to build a unique mobile machine with two Intel Atom chip embedded into it. Named as Swordfish Net N102, it is powered by two Intel Atom N270 processors clocking at 1.6GHz, offering sufficient CPU power targeted for multi-tasking applications in both office and home environments. With the solution is still paired with Intel 945GSE chipset, the graphics performance may not as good as some of the Intel Atom Nvidia solution. But it took about six months for the Columbian manufacturer to modify the architecture and design to support both processors with parallel processing so that the workloads can be balanced between these two cores for performance boost needed at certain usage models. 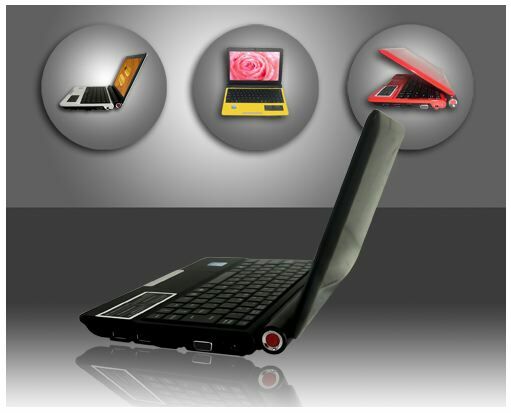 Some other specifications include standard netbook feature sets such as a 2GB memory RAM, 160GB hard disk drive, built in WCDMA 3G module, 802.11b/g wireless LAN technology, a 1.3-Megapixel webcam, 10.2-inch LCD display panel and many more. As expected, the current drawn by these processors will actually shorten its battery life significantly and with a conventional three-cell battery pack, it will only able to provide 2.5 hours of normal operability for practical use. Nevertheless, consumers can opt for an optional six-cell battery pack at extra $29 for additional two hours of working time. Priced at $450, the machine will be preloaded with Windows XP Operating Systems that makes it an affordable but yet much more powerful netbook in commercial space.